Siblings are arranged from left (eldest) to right (youngest), with exceptions. Alvis is older than Azel. Celice is older than Yurius and Yuria. Additionally, it is unclear who is older out of Maybell and Meng, so these two are ordered arbitrarily. 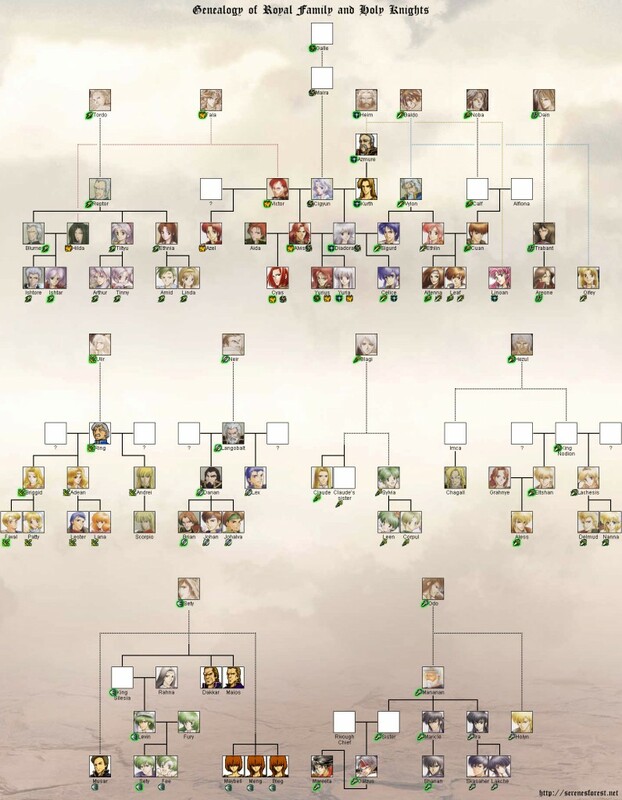 Assumptions have been made concerning the Holy Blood of characters who do not appear as map units in Genealogy of the Holy War. For instance, it is unknown whether King Silesia possessed major Holsety blood or not. Grahnye is mentioned in the Fire Emblem: Treasure book. Calf and Alfiona are mentioned in the Thracia 776 Illustrated Works book. The identity of Galzus’s mother is mentioned in the 20th Anniversary Encyclopaedia.